The 7.2 acre fully residential campus in Gurgaon boasts of world class infrastructure and modern amenities that are necessary for creating a world class learning experience. These amenities include state of the artclassrooms, air conditioned hostels for men and women, high speed Wi-Fi connectivity, student lounges, a fully equipped library, resource centre, games room, gym, amphitheatre, cafeteria, etc. Moreover, students also have the benefit of exploring the various social, cultural and entertainment hubs of Gurgaon and Delhi. The campus leverages its location in the corporate hub of the country and enables extensive industry engagement with CXOs and industry experts visiting the campus regularly to share their perspectives. The Great Lakes Gurgaon campus is located just off NH8, close to Manesar at the Bilaspur-Tauru road and is easily accessible from the corporate hubs of New Delhi and Gurgaon as well as from IGI Airport. 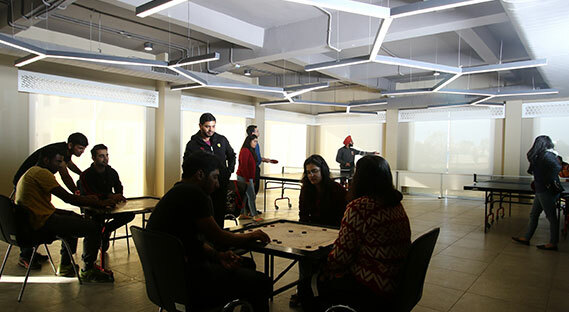 The campus is located in the close vicinity of various education and research centres including The National Brain Research Centre, Amity University, BML Munjal University and the planned Indian National Defence University.